The perfect side dish to any holiday meal! 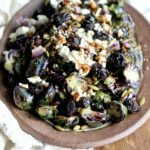 These Roasted Brussels Sprouts are festively topped with dried cherries, toasted pumpkin seeds and balsamic reduction! Preheat the oven to 400’F and coat a large baking sheet with oil or foil coated with non-stick vegetable spray. Place the balsamic vinegar in a small saucepan and bring to a boil over medium heat. Cook for 10 minutes or until reduced by half. Vinegar is done when it’s thick enough to coat the back of a spoon. Set aside to cool. Toss the Brussels sprouts and onion with the olive oil, salt and pepper in a large mixing. Spread out in an even layer on the prepared baking sheet. Roast for 20-25 minutes, until browned, stirring once halfway through cooking time. Remove from the oven. Pour into a serving dish and garnish with pumpkin seeds, cherries and feta cheese. Drizzle with balsamic reduction and serve.